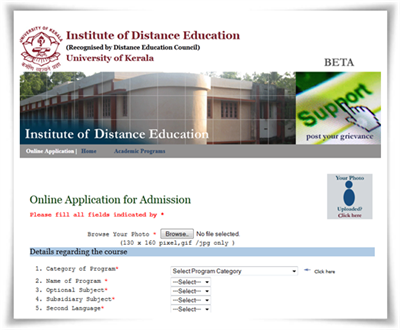 Applications have been invited by Institute of Distance Education, University of Kerala for admission to MBS course for the Academic Year 2014-15. Eligible candidates can apply for the admission through the official website www.ideku.net. A candidate with a Bachelor's degree in any discipline from any recognized University or from the University of Kerala can apply for the distance education course. It is very important to read through the prospectus before applying for the course. The prospectus and application forms are now available on the official web portal. The application forms can also be obtained from the SDE office at Palayam, Forms Sales Counter (Palayam Campus), District and Taluk Information Centers of the University of Kerala and Learners' Support Centres. The prospectus fee Rs. 250 for MBA will be Rs. 450 which includes the Entrance Exam fee. Overseas students have to pay Rs.750 including Entrance Exam fee. Students who wish to take admission with the Kerala University can apply online and should send the acknowledgement with relevant documents to the Director, University of Kerala. DD can be drawn from SBT in favour of The Finance Officer, University of Kerala which is payable at SBT service branch Thiruvananthapuram. Applicants must read the instructions carefully before starting filling the application. It is very important to check whether the candidate has met the eligibility criteria before filling up the application form. Basic and relevant information should be provided with care under appropriate sections. Applicants should make sure to sign and affix photo on the online acknowledgement print out. Appropriate documents in original to prove the qualification should be submitted along with the application. The application number printed on the acknowledgment should be kept for future reference. Students seeking admission to the MBA program should pay Rs 100 for Department Development fund fee (DDF) at the time of admission. Overseas applicants can submit DD from any Bank listed in the prospectus. Those who have passed the qualifying exam from outside Kerala University should produce the eligibility certificate from the Registrar. The last date for receiving application is fixed to 31st August 2014 for MBA program. The MBA program will have an entrance examination scheduled to be held on 14th September 2014 at various centres in Kerala.